Owls have always had a popular following, representing as they do wisdom, knowledge, and learning. Their popularity may have been further bolstered by their use in the Harry Potter books and movies. Recently an articulate and fine specimen has emerged as a spokesman for the America’s Best Eyeglasses line, suitably bespectacled and able to model different frames simply by an uncanny rotation of his head. The owl himself is both wise and extraordinarily expressive, with a lot of eye and other facial movement. 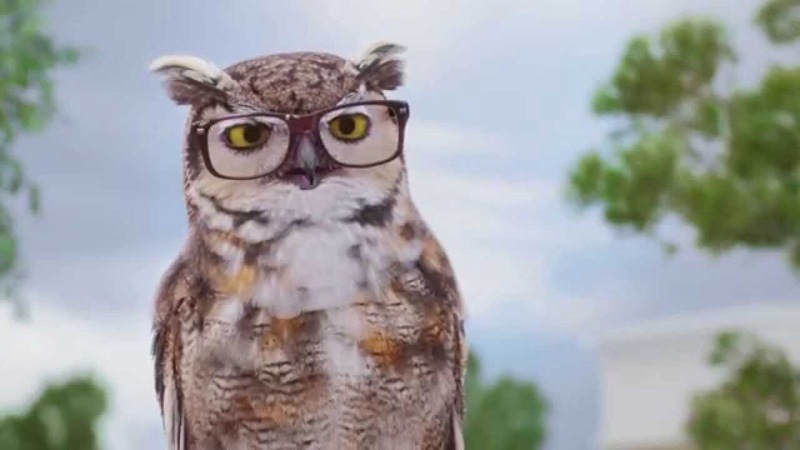 He is further able to cast the hapless human into mimicking the usual owl role, reducing them to single-word utterances of “who?” as he elaborates on virtues of the eyewear company.